Status, but also from waitlist pax who have requested upgrades with miles/co-pay or with stickers..if equal then spending with AA plays a role, too. Not easy/common to get upgrades for non-AA elites solely based on status, can happen, but not as automatic as for their own elites. You should not be on the upgrade list if your status is not with AA. I would imagine that the upgrade came as they were overbooked and did not have AA status members to move. Potentially same for when you were put on the upgrade list but it did not clear. How did you verify that you were on the list? I know, but they only do initial and first three letters of the last name on the screens and on the app. I have been on the cleared list based on that without moving from my Y seat. Just another passenger with the same letter combo. Saw my name combo on the list at the gate. When I saw my name getting green mark, I approached desk and got new seat. I dont have even AA account. Maybe they were out of elites, it was on DFW-CZM, which is probably not very top heavy. I guess you got very lucky I have had upgrades on AA, but as I usually don't watch the lists, knowing II should not be on them, I have been called to the gate or gotten the delightful tone of error when my boarding pass was scanned. It does happen, but as non AA elites we are not part of the domestic upgrade program. Some clueless (or helpful) AAngels will put you on the list whether or not they're supposed to. Only once have I been successful. Almost had such luck again at LGA in December until one of the two at the Admirals Club desk realized I had an AAdvantage award (as there are no upgrades whatseover on awards) where I put my AY+ number in to show status. Tried at the gate too and there they realized "Look it's AY and not AA" and pointed to the tiny corner where that is displayed. NoWindowSeat and FFlash like this. Onboard they always acknowledge me as exp. Even as Gold/Sapphire I get regularly recognized as EXP. 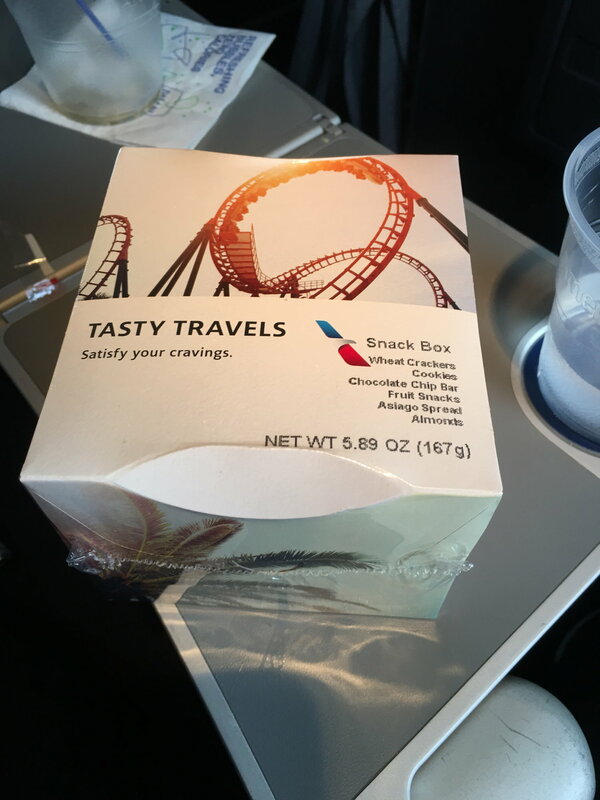 On a domestic flight the purser came after the drink service (which includes free booze for MCE rows) with snackboxes and said "My manual says I'm supposed to offer you one of these" and gave me a choice of different options. What a great way to make you feel appreciated!! ffay005, FFlash, miamiflyer8 and 3 others like this. All OWE's are treated the same - you get a drink and a snack. "My manual says I'm supposed to offer you one of these"
"My manners tells me I'm supposed to say thank you"
ffay005, FFlash, Furry and 3 others like this.